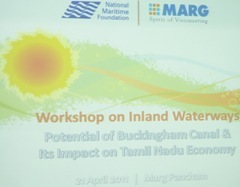 National Maritime Foundation (NMF) and MARG Group conducted a Workshop on Inland Waterways – Potential of Buckingham Canal & It’s Impact on Tamil Nadu Economy on April 21, 2011 at Samudra Conference Hall, Marg Pancham, Sholinganallur, Chennai. Capt K N Ramesh, CEO – Dredging & Logistics of Marine Infrastructure & Services of MARG Group has organized the workshop at short notice by mobilizing all the resources available with MARG Group. Emphasized that the inland waterways are as important as railways, roadways and airways but unfortunately remain neglected. 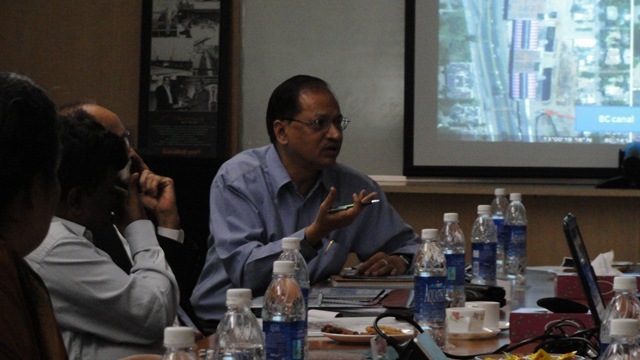 Expected the workshop to bring out an action plan to revive the Buckingham Canal. 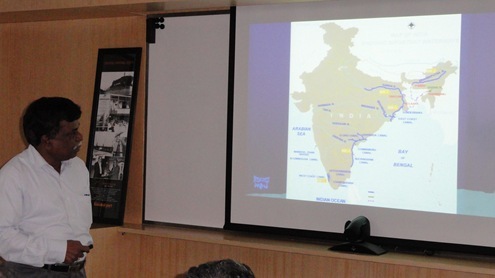 Mr GRK Reddy Chairman & Managing Director, MARG Group personally welcomed the participants and highlighted the following to explore potential of Buckingham Canal to boost Tamil Nadu economy. Waterways are time-tested means of transportation and are more cost efficient, fuel efficient, environment friendly. It is better to improve the already existing Buckingham Canal infrastructure (but neglected for the last 40/50 years) instead of going for a new one. would help as an alternate means of transportation to extend metro corridor up to Mahabalipuram/Mamallapuram. would be a value addition to the environment if the water body is cleaned up, protected and forestation is developed on both sides of the canal. would be a value addition to the economy. He further informed that MARG Group is ready to provide all necessary support in Buckingham Canal development. Inland Waterways must be given the same priority as that of Road Transport & National Highways. Buckingham Canal was branded as nobody’s baby so far; he expected the workshop to identify whose baby it is and also to specify what needs to be done further to revive the canal. Dr T S Sridhar, IAS, Principal Secretary/Commissioner of Museums. Mr. Ashok R Thakkar, Commodore of Tamil Nadu Sailing Association. Dr. Jayshree Vencatesan, Care Earth Trust. 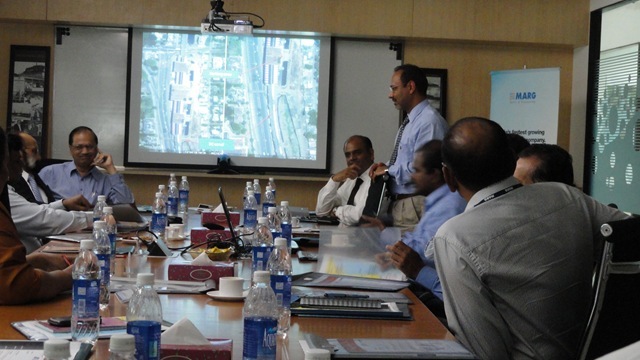 Presentation by Mr S S Pandian, Chief Engineer, IWAI. Gave brief details about National Waterway 1, National Waterway 2, National Waterway 3, National Waterway 4, National Waterway 5. A stretch of 50 km from Ennore South to Muttukadu [18 km of North Buckingham Canal (Ennore South to Central Station of Chennai) and 32 km of South Buckingham canal (Central Station of Chennai to Muttukadu)] in Tamil Nadu can not be developed as a waterway due to landfilling/encroachment, MRTS route and other railway lines. During monsoon, the rain water fills up the canal; provisions are available to fill the canal with sea water during other seasons. Cost estimated as INR 1515 crores (in the year 2009) for 1027 km length of canal; project implementation period is expected to be 7 years in two phases. 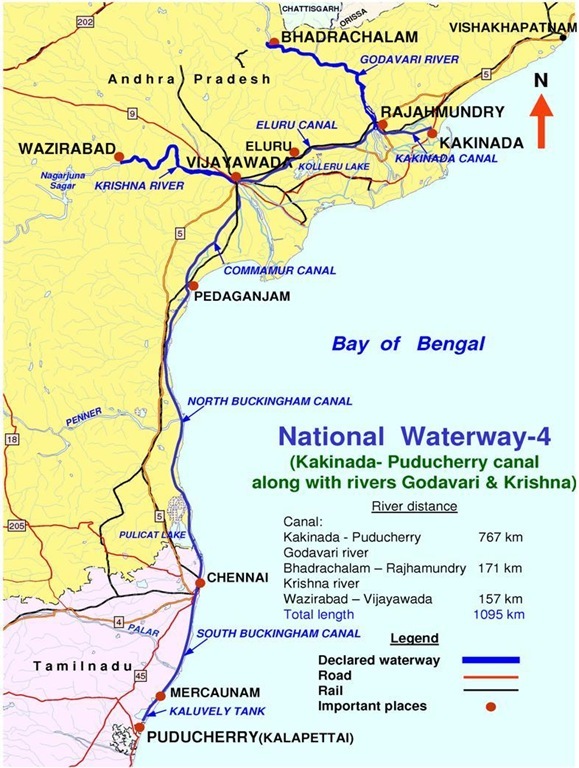 As sufficient funds are not available, Planning Commission has advised IWAI to develop the National Waterway 4 under PPP mode with Viability Gap Funding. In September 2010, it was decided to develop potential stretches under PPP mode. The waterway has to remain closed for minimum 30 days in a year for preventive maintenance. 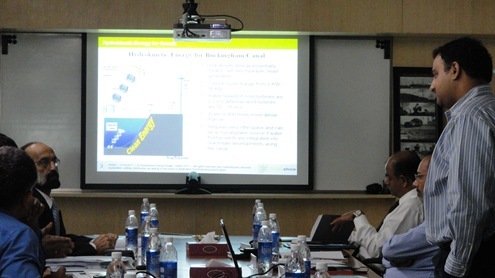 Presentation by Mr Malolan Cadambi, Managing Director, Greenshore Energy. Generation of electricity by tapping Hydrokinetic Energy in Buckingham Canal. It is possible to use compact turbines (pico-hydro) starting from 2 KW without any large infrastructure. Power generated can be integrated with wind/solar/grid power. Cost effective as Carbon Credits are available for the turbines. Tapping osmotic power (using the salinity of river and sea water) in river mouths can also be explored . The subject presentation triggered a brainstorming session. The following points were brought out. Use of water by priority: drinking; irrigation; power; navigation. All waterways are precious and have to be preserved irrespective of the type of use. 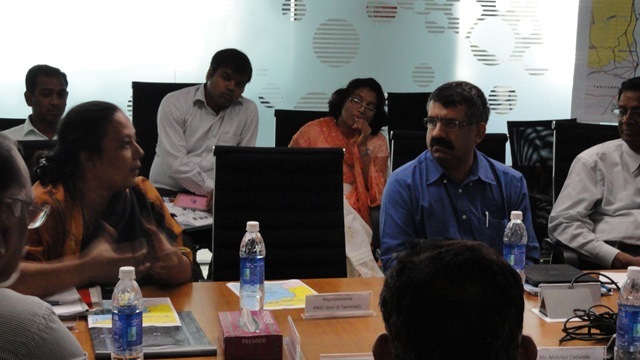 How to effectively use inland waterways needs to be learned from Goa. Inland Waterway in the east coast was earlier known as ‘East Coast Canal’ linking all rivers along the east coast. Practice of dumping municipal waste in the canal has to be stopped. Industries must be refrained from polluting waterways. Transportation of perishable items like fruits, vegetables, flowers. 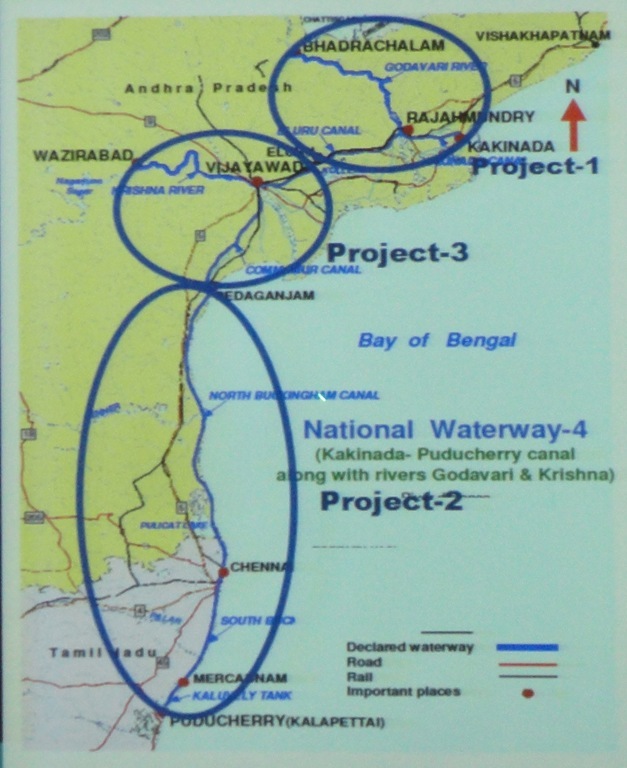 River Water Authority of Tamil Nadu also to be involved in canal development. Services of Mr K Phanindra Reddy, MD & CEO of TNUIFSL needs to be taken for the canal development. Canal development must also consider ecological restoration in the area instead of concentrating only human centered development. The encroachments/resettlement plans in the path of surface water sources to feed the canal must be cleared to charge the canal and to restore ecology. Ecological Management Plan must be part of the canal development from the beginning. Problems identified for canal development: Ecology/Environment problem, funding problem, regulatory problem, coordination problem. If it is shortage of funds, private sector can mobilize funds. Backwaters at Muttukadu, Adyar river mouth, Cooum river mouth have to be set up to clean up, to sustain, to enhance marine life in the canal. 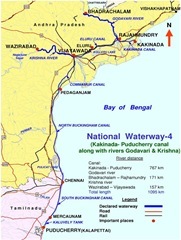 Small stretches of waterways (5 km length) can be identified, developed in Chennai city for recreational, tourism purposes. The Executive Committee must prepare a report to revive the south Buckingham Canal (except 50 km stretch in north/south of Chennai city) and submit to the Tamil Nadu government. 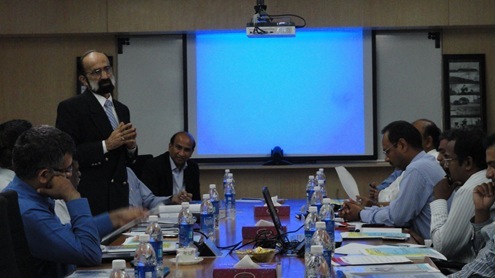 Capt K N Ramesh, CEO – Dredging & Logistics of Marine Infrastructure & Services of MARG Group was nominated as the coordinator to form a forum and also inform other participants about the progress being made to revive the Buckingham Canal. 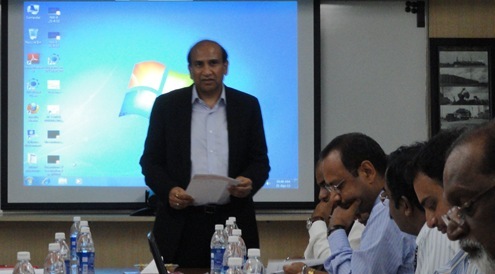 Vote of Thanks was given by Mr Arvind Sagar, President – Corporate Initiatives & Planning, MARG Group. The workshop concluded with a networking lunch. 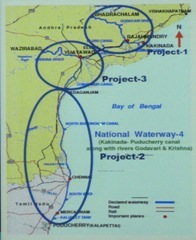 Details of Buckingham Canal is reproduced from DPR for Development of Navigation in National Waterway 4. The Buckingham canal is a tidal canal. It was constructed during 19th century along the Coromandal Coast. The main purpose of the canal was to have a lock-in-canal with extensive provision for passing upland discharge so as to retain a surface water level in the canal approximately upto the highest prevailing tide to facilitate inland navigation. The flood gates/locks were provided in various sea mouths to prevent silting caused by daily variation of tides. Locks serve another purpose of creation of impounding facility to retain high water level in the canal between low tides and also during the periods when sea bars are closed. After various stages of improvements and construction of lock chambers, and surplus escapes for drainage, the canal carries only Salt Water. The canal has been divided into two portions, viz North Buckingham Canal, and South Buckingham Canal. The North Buckingham Canal of a total length of 316km starts off after Peddaganjam Lock in A.P (where Commamur Canal ends) and ends at Central Station of Chennai in Tamil Nadu, from where the South Buckingham canal starts .The South Buckingham Canal of a total length of 110 Km ends at Kovalam North River lock in Marakanam. North Buckingham canal from Ramperu lock has a bed width ranging from 15 m to 30 m. At present the condition of North Buckingham Canal is such that it remains almost dry. The banks have eroded. There are many salt pans all along the canal. During March to July every year, the canal remains totally dry. There are several confluences of rivers i.e. Paleru, Manneru, Musi and Pennar along the North Buckingham Canal. The range of the tide is about 0.7 to 1.0m. The South Buckingham Canal is also a tidal canal. It has sea openings at seven places viz. 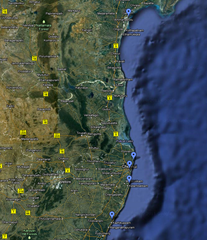 Marina beach, Adyar, Muthukadu, Kalpakkam (Ediyuru), Palar, Paramankani Kuppam and Markanam. Locks are provided in the canal near sea openings to control the tidal flow and retain the desired water level in the canal. Sand bars have been provided at these openings due to which it remains closed for about seven months in a year. There are confluences of rivers Cooum and Adyar in Chennai city along the South Buckingham Canal. But as these rivers are rain fed rivers, and remain dry during non-monsoon periods. Hence the canal takes water from sea only. The canal in Chennai City is totally in abandoned condition. It has silted up heavily. Its banks have been heavily encroached where huts and houses have come up. The width of the canal is in the range of 10 to 15m. To add to it, T.N. Govt. has allowed Mass Rapid Transport System (MRTS), to construct Elevated Railway Stations right over the canal as per the recommendations of the Working Group appointed by the Planning Commission in 1976-77. In many places, the columns of MRTS flyover bridges are within the canal bed itself and in certain places, the pedestal foundation of column is exposed above the canal bed. Therefore, there is no navigation possible in the Chennai stretch. Alternative suggested by earlier consultants of constructing a Bye-pass canal in Chennai City is also ruled out because of non-availability of adequate water and high density population and space crunch in Chennai City. It is therefore recommended that the Stretch inside Chennai City of approx 50 km should not be taken for IWT development. Thanks to MARG Group for the excellent arrangement and hospitality provided to the participants. The concept of an Inland water canal is very useful in many ways. For e.g Metro Water ways could be coined, clubbed with eco logical development of the regional environs, in a natural mode. This would go a long way for building up of a holistic up bringing of a region. m/s, green multi energy pvt ltd.
After a great lapse of a few years, we did get a response on the concepts of using inland sewage canals- Nullahs- for varied uses. This indeed is a blessing in disguise. With Mr. Shriram Vedire as an Expert on Ganga and other rivers clean up , interlinking of rivers. Also fast metro transport of goods and passengers can be prospected on these water ways using over head traction as done in European canal and sea routes..
Any more ideas.. all are welcome..
Proff. Ajit Seshadri, HOD BE Marine Engineering, Vels University, Chennai 603103. இது குறித்து தமிழ்நாடு முதலமைச்சரின் தனிப் பிரிவுக்கு 23/12/2014 அன்று கோரிக்கை வைத்தேன் (எண்: 2014/812990/CR). 06.01.2015 அன்று பதில் வந்தது. பக்கிங்ஹாம் கால்வாய் தென்னிந்தியாவின் மிக நீளமான நன்னீர் கால்வாய். சோழமண்டலக் கடற்கரைக்கு இணையாக ஓடும் கால்வாய். இக்கால்வாய் ஆந்திரப்பிரதேசத்தின் விஜயவாடாவில் இருந்து தமிழகத்தின் கடலூர் மாவட்டம் பரங்கிப்பேட்டை வரை செல்கிறது. 1806 ஆம் ஆண்டு வெட்டத் தொடங்கி பல கட்டங்களில் பல்வேறு ஏரிகளையும் ஆறுகளையும் இணைத்து உப்பு நீர் ஓடும் இக்கால்வாயின் நீளம் 420 கிலோமீட்டர்கள். இக்கால்வாய் ஆங்கில ஆட்சியின் போது அமைக்கப்பட்டது. 19, 20 -ஆம் நூற்றாண்டுகளில் ஒரு முதன்மையான நீர்வழியாக இது விளங்கியது. இக்கால்வாய் கடற்கரையில் இருந்து சென்னைக்கு பொருட்களைக் கொண்டு செல்ல முதன்மையாகப் பயன்படுத்தப்பட்டது. சுதந்திரத்திற்குப் பிறகு கவனிப்பார் இல்லாமல் அழியத் தொடங்கியது. 2004 ஏற்பட்ட சுனாமியின் பொது பல லட்சம் உயிர்களை இது ஒரு வடிகாலாக இருந்து காப்பாற்றியது. தற்போது யாருக்கும், எதற்கும் உபயோகம் இல்லாமல் ஆக்கிரமிப்பு செய்யப்பட்டு உள்ளது. எனவே, மீண்டும் பக்கிங்காம் கால்வாய் நீர்வழிப்பாதை திட்டம் மேம்படுத்தப்பட்டால் போக்குவரத்தில் தமிழகம் மிகச்சிறப்பான இடத்தை பெறும். இலட்சக்கணக்கான மக்கள் பயளடைவார்கள். நமது அரசு செய்யுமா? The scheme for utilising the Buckingham canal as on inland water ways is under the consideration of the National Inland Waterway Authority and the same would be implemented in due course. Petitioner informed vide EIC WRD PWD Chepauk ch-5 lr.no.S7/CMP/CR/2014 dt 05.01.15.